One of the other sites on which some of my articles are posted is U.S. site Seeking Alpha but this doesn’t allow me to publish the same articles here so if you’d like to read them you’ll need to read them on Seeking Alpha. My three most recent articles here relate to the performance of the precious metals stocks I recommended at the end of last year – rather better than I had anticipated, particularly with respects of what are probably the top two royalty stocks, Franco Nevada and Royal Gold which both comfortably outperformed the Dow and the S&P500, despite the somewhat disappointing progress of the gold price, and a second one is on Randgold’s Q3, which on first look was pretty dire and the stock price plunged accordingly, but in fact was largely in the company’s own forecasts and still leaves it on track to reach the top end of its 2017 guidance. Overall Randgold has been the star performing major gold miner and the recent stock price dip should provide a buying opportunity. Randgold: Difficult Q3 But Still On Track To Meet Top End of Guidance. Note: the above articles were written for a North American investment audience so use U.S tickers – and spelling! Holmes on Franco Nevada – Gold mining industry royalty! Frank’s paean of praise for gold royalty companies and for, in particular, Franco Nevada and its founders, Pierre Lassonde and Seymour Schulich. Franco Nevada’s royalty concept has enabled it to increase its dividend by a massive. As Frank points out, since 2011, Franco-Nevada has raised its dividend incrementally from $0.04 per share to $0.21 per share—a phenomenal increase of 424% and it has managed to do this even as spot gold has declined 38%. 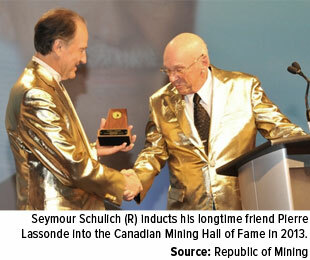 In 1983, my friends and early mentors Seymour Schulich and Pierre Lassonde founded Franco-Nevada Mining, the world’s first gold royalty company. The two uniquely gifted money managers were on to something big. It was originally Seymour—then an oil analyst at the Canadian investment firm Beutel, Goodman & Company, where he and Pierre met—who recognized that the royalty model used in the oil and gas industry had some of the highest returns on capital. Fast forward more than 30 years, and Franco-Nevada now has a market cap of over $8.2 billion, making it the world’s largest and most successful gold royalty company. Franco-Nevada was my first initial public offering (IPO) to work on as a young analyst at Toronto-based, boutique investment firm Merit Investment Corp. Even then, I recognized the superiority of the business model. For the next 20 years, until it merged with Normandy Mining and Newmont Mining in 2002, I watched the company return an average 38 percent to shareholders annually. Ever since its second IPO—Newmont spun it off in 2007—Franco-Nevada’s stock has outperformed both gold bullion and global gold miners. Today, I’m just as convinced of Franco-Nevada’s business model. Its uniqueness allows the company and its royalty peers to generate high gross margins and ever-expanding dividends. I feel extraordinarily blessed to be able to call Seymour and Pierre my friends. The two are certified superstars of the resource sector. Pierre’s “The Gold Book,” published in 1990, is a seminal masterpiece on the topic of gold investing. But beyond that, they’re just exceptional human beings, both of them loving husbands and fathers. Their differing personalities complement each other well. Whereas the frugal Seymour prefers to drive the same Lincoln for decades, Pierre enjoys the engineering and sleek design of a Ferrari. Both are among the most generous philanthropists alive today, responsible for donating hundreds of millions of dollars to various causes in Canada as well as abroad. Pierre is a benefactor of theLassonde Entrepreneur Institute at the University of Utah, which pairs faculty members with business, engineering and science students and helps them write business plans. In 2011, he donated a massive $25 million to expand the School of Engineering at York University, where the Computer Science & Engineering Building was renamed the Lassonde Building in honor of his generosity over the years. 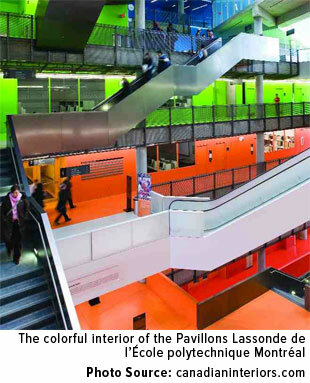 At the École Polytechnique de Montréal, Canada’s top engineering school—and where Pierre received one of his many degrees—a series of buildings named for Pierre and his late wife Claudette house the library and departments of computer and electrical engineering. In 2004, these buildings received the coveted Pilier d’or—Canada’s highest award for philanthropy in the French-Canadian community—for their “respect for the environment, efficiency objectives with a focus on sustainable development, technological innovation and innovative energy use,” according to the university. 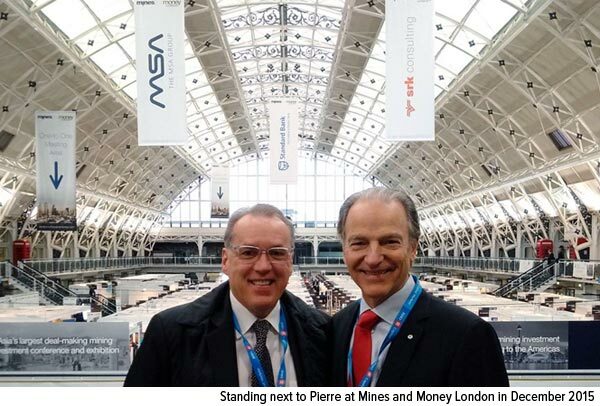 In December 2015, Pierre received Mining Journal’s Lifetime Achievement Award at the Mines and Money conference in London. 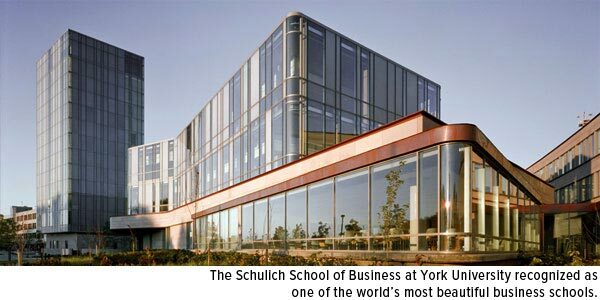 Similarly, Seymour is a benefactor of several schools and organizations, including the Schulich School of Business at York University in Toronto, which offers the Kellogg-Schulich Executive MBA program—ranked #1 in the world by The Economist—as well as the Schulich School of Medicine and Dentistry at Western University. 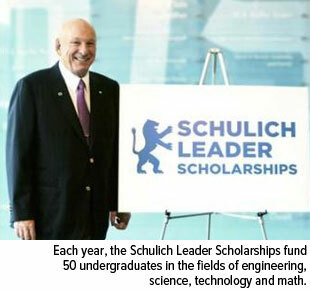 He’s also benefactor to the Schulich Heart Centre at Sunnybrook and Women’s College Health Sciences Centre in Toronto, the Library of Science and Engineering at McGill University and many others across Canada and the U.S. McGill, in fact, renamed its music program the Schulich School of Music in September 2005 in recognition of Seymour’s gift of $20 million, the largest such gift in the history of the university. In 2000, Seymour was awarded the Order of Canada, the highest honor a Canadian citizen can receive. It’s comparable to being knighted (in the UK) or receiving the Presidential Medal of Freedom (in the U.S.). I still remember being invited by Seymour to accompany him during one of his famous Sunday morning, two-hour walks. As we strode along, he shared with me the topic of a book he was reading, “Learned Optimism” by University of Pennsylvania professor Martin Seligman. He explained in detail that just as people can learn helplessness, so too can they cultivate optimism. Similarly, many resource investors right now might feel discouraged by low commodity prices. But Franco-Nevada gives us reason to feel optimistic. As a refresher, royalty companies basically serve as specialized financiers that help fund cash-strapped producers’ exploration and production projects. In return, they receive either royalties on whatever the project produces or rights to a “stream,” a commitment to an agreed-upon amount of the commodity per year. Royalty companies have a history of rewarding their investors handsomely, even during economic downturns. 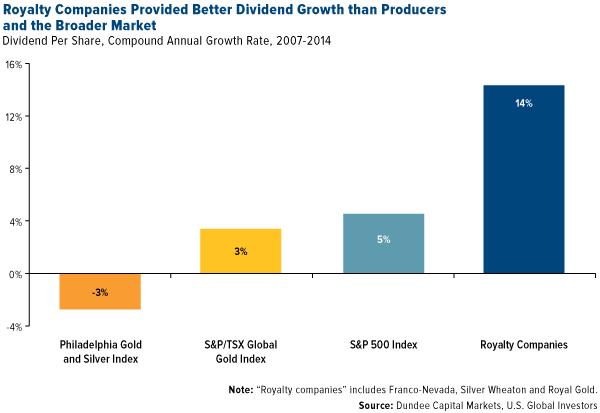 Between 2007 and 2014, Franco-Nevada, Silver Wheaton and Royal Gold—the “Three Amigos”—had a combined dividend growth rate of 14 percent. Compare that to 5 percent growth for S&P 500 Index companies and between -3 and 3 percent for precious metals miners. Since 2011, Franco-Nevada has raised its dividend incrementally from $0.04 per share to $0.21 per share—a phenomenal increase of 424 percent. What’s even more amazing is that it’s managed to do this even as spot gold has declined 38 percent. Like other royalty companies, including the new kid on the block, Osisko Gold Royalties, Franco-Nevada has a much lower total cash cost than miners do. Dundee Capital Markets estimates that whereas gold miners produce at a breakeven cost of $1,087 per ounce, royalty companies get by with a materially lower cost of just $441 per ounce. They’re just better allocators of capital and very aware of the risks of dilution and value factors on a per share basis. The mining companies, on the other hand, have diluted the value of their reserves and cash flow on a per share basis with poor acquisitions. Take a look at how Franco-Nevada, Silver Wheaton and Royal Gold stack up against Newmont, the only gold company in the S&P 500 Index, and Goldman Sachs. When it comes to sales per employee, the royalty companies largely win out. Their balance sheets are also much less leveraged. Franco-Nevada, in fact, carries no outstanding debt. This helps eliminate many of the investment risks faced by operators such as Newmont, which typically have huge capital and operating costs. Franco-Nevada’s balance sheet and gross margins make it a much more attractive buying opportunity. It’s also worth pointing out that Franco-Nevada has a broader portfolio of royalties than its peers and pays its fair share of Canadian income taxes. One of the few risks involved with Silver Wheaton is its dispute with the Canada Revenue Agency, the “IRS” of Canada, which hopefully will be resolved sometime this year. Not all royalties companies are entirely risk-free, but their business model remains superior. Another big value is the power of optionality. Royalty companies get an option on all future exploration and potential growth at no additional cost. In other words, mineral deposits are very often larger than what a royalty company pays for. This is what’s known as “blue sky.” At the time of the deal, only the documented reserves and some portion of the defined resources are generally part of the valuation proposition. However, as time passes, the company will explore for new resources on the property. If anything is found, the royalty company will generally get paid for any future ounces, with some limitations. Royalty companies avoid many of the industry’s most common challenges, including huge operating expenses, unions, liabilities and legal hurdles. They don’t build the mine’s infrastructure, experience capital cost inflation or have teams of miners and other personnel on their payrolls. (Franco-Nevada currently has fewer than 30 employees. 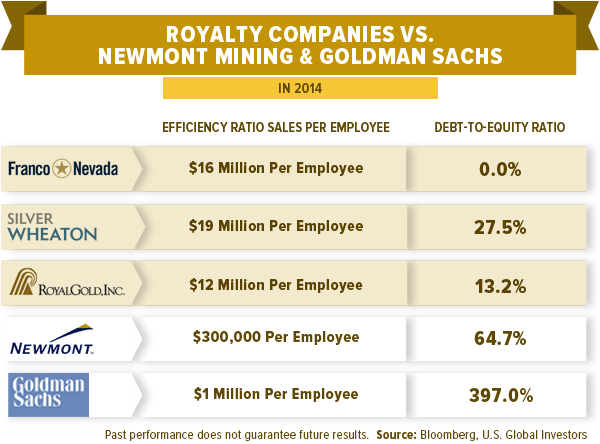 Newmont, by comparison, has around 28,000.) They’re not responsible for cost overruns or maintenance. Nor must they worry about mining in a country that operates under a completely different legal system. The U.S., Canada and Australia, home to some of the world’s largest mining companies, all follow common law. 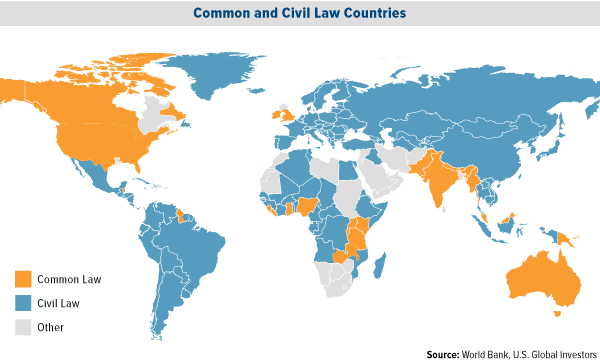 Yet many American, Canadian and Australian companies produce in civil law countries found mostly in Latin America and parts of Africa. In civil law countries, the government has eminent domain over all mineral wealth of the country. Securing rights and permits is therefore much more bureacratic and arduous, and at any time, the government can attempt to revoke them. Surface rights and subsoil rights are often governed by entirely different sets of laws. And although they’ve improved since the 1980s, mining duties, income taxes and tax royalties still tend to be steep and unstable. Is the “Smart Money” Telling Us that Gold Has Hit a Bottom? 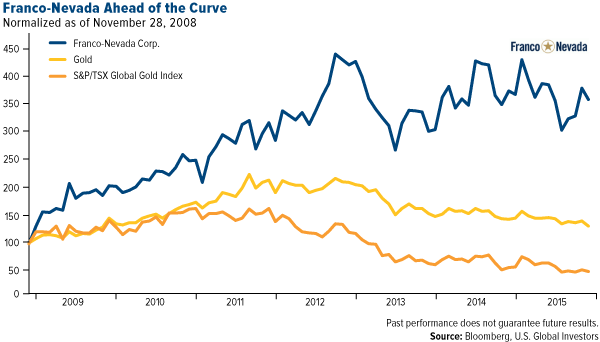 When gold soared to $1,900 per ounce in 2011, many producers, expecting the good times to last, spent like crazy. The royalty companies, meanwhile, prudently kept their powder dry and built up their cash. Now that gold is hovering in the $1,085 range, down 38 percent since the all-time high, they’ve started deploying their massive reserves to buy streams from desperate sellers. Franco-Nevada recently agreed to pay $610 million for a portion of silver production from Teck Resources’ Antamina copper and zinc mine in Peru. Many analysts call Franco-Nevada and the other two major royalty companies the “smart money” of the gold industry. I have to agree. They have huge intellectual capital and employ mining engineers, metallurgists, geologists and financial consultants. They’ve acted as bellwethers in the past, giving investors a good reading of where prices and sentiment could be headed. Such is the case right now. Investment dealer Paradigm Capital reports that the top three royalty companies have spent a collective $3.8 billion over the past half year of 2015. “We doubt there has ever been such a spending period,” the investment group writes, noting that when you see this level of investing, it’s often a good sign of a bottom in prices. For more on gold and other hard assets, be sure to follow our award-winning newsletter, the Investor Alert.